Having honed his skills at Audio Alchemy, Dusty Vawter of Channel Islands Audio is a friend of the small box, a servant of the little guy with his slim wallet. This means aluminum extrusions with thin front and back covers, outboard 14vAC wall-wart power supplies and upgraded power supply options [the VAC-1 in this instance]. Dusty's credo is big bang for the buck. His battle cry is trim the fat. Be economical with the cosmetic, give the best sound for the least amount of dough. That's quite the melodious counter point to our climate of escalating audiophile pricing. 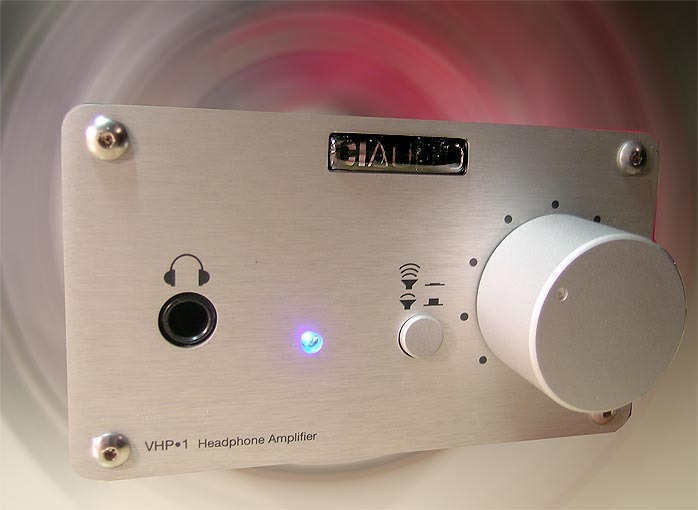 Having a foot print smaller than a CD jewel box, his newest, the VHP-1 headphone amplifier, still manages to add two clever features: a hi/medium-gain switch on the front and a loop-thru set of outputs on the back. No longer does your headphone amp have to hog your treasured source if that lacks twin outputs to be simultaneously strapped to a headphone amp and preamp. With the loop feature, the VHP-1 inserts between your source and main rig. It never needs to be disconnected when you want to listen to your main speaker rig. Clever, that. There are $2,000 headphone amps not nearly as considerate. A translucent self-stick plastic badge, a tiny blue power LED and a nice chunky-monkey aluminum knob for volume complete the frontal stuff while a regular circular mini jack for the wall wart umbilical and the i/o RCA ports grace the rear. Little rubber bumpers beneath play footsie with whatever serves as the ground plane. The VHP-1 lacks an on/off switch and presumably isn't meant to be turned off. To test the unit, I'd use my beloved audio-technica ATH W-1000s and alternately, the HD-650s which serve as a more widely known (though far more uncomfortable) reference. As any self-respecting outboard headphone amp should, the CIA unit eschews the usual op amps sitting on the far end of receiver/CDP-based black holes - the ones you're supposed to plug your upscale cans into. Instead, we're treated to a current-feedback circuit said to drive 30 - 700-ohm impedances. That just about covers any imaginable headphone likely to be mated to the VHP-1. With bandwidth to 100kHz, S/N ration of 120dB and THD+Noise of 0.00014%, this mighty mite is as quiet as a church mouse and as fast as a cheetah. Warranty that cheetah won't eat mouse for breakfast? One year. To take the measure of this mouse, I'd use the in-house Benchmark Media DAC with its on-board optimized headphone amplifier as well as the headphone sockets of my elderly Marantz semi-professional CDR630 CD recorder, my modified Jolida JD-100 and my bedroom Eastern Electric MiniMax. Interconnects in all cases would be Crystal Cable's new Piccolo, a 1.5mm thin, $399/m/pr silver/gold solid-core cable with Kapton dielectric, Teflon sheathing and Furutech-inspired custom RCAs. 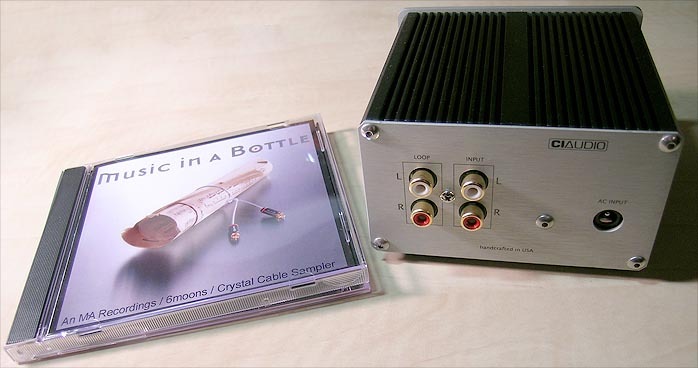 Ken Micallef will formally review it as part of his forthcoming Crystal Cable Micro review. You'd assume that for $349, a serious outboard headphone amp should smoke the op-amp powered jacks added to CD players and such, right? Would this Channel Islands champ rule with an iron first across the board and equally into both of my loads? Or might the right combination of low-brow front panel jack and headphone on one of my CD players -- or even into the Benchmark DAC -- be as good or better than the outboard route? Only one way to find out.